48 Can-A-Thon is just around the corner. 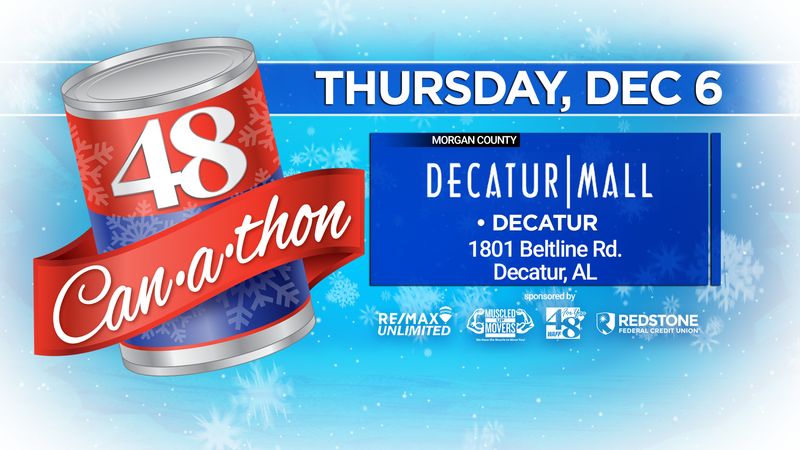 The Heart of the Valley community is gearing up to donate cans to the WAFF 48 Can-A-Thon. Now there are more collection sites where you can do just that. For 26 years the WAFF 48 Can-A-Thon has partnered with some very special local food banks to help people who are struggling to improve their lives. To do this we work closely with non-profit community organizations to collect food for those who need it most. The food collected stays in the county in which it was collected. Every year the Tennessee Valley donates hundreds of thousands of cans of food. Food banks across the country are stretched thinner every year but the need continues to grow. Give what you can this holiday season to the many great charities in our area. Your generous donations will mean the world to those in need. For a complete list of local charities in your area TAP or CLICK HERE.